The first thing to be considered before deciding to give a private ball is whether you have rooms enough, and whether they are fitted for the purpose. In order to have your arrangements complete, six or seven rooms at least should be set apart for this festivity—two cloak-rooms, tea and refreshment room, drawing-room for the reception, ball-room, card and supper rooms. Card tables can be placed in the drawing-room when a separate room for their use is not available. For the dance to be perfect, everything ought to be of the best— good room, good floor, good dancers, good music, and good supper; but it is impossible to compass the whole of this list in every case; therefore, the indispensables must be pointed out. We cannot alter the size and shape of our rooms, but one must be chosen as large as possible, and nearly square if possible, for a long narrow room is fatal to dancing; nor can we lay our floors afresh, but we need not fatigue our guests by obliging them to dance upon carpet. There can be no doubt that a polished floor, such as one meets with on the Continent, is the pleasantest and easiest to dance upon, but if our boards are rough ones, a brown holland covering stretched tightly over them will be a good substitute for more substantial smoothness, if properly done, and is far preferable to another device which is sometimes most unwisely resorted to—viz., waxing the floor. Good music is a sine qua non. If this be not secured—no matter whether the entertainment be what is called a “dance” or a “ball “—it will certainly be a failure. The want of it destroys all chance of enjoyment. It is impossible to dance well to bad music. “Bad music” means uneven, uncertain playing, and this is sure to be the result when amateurs attempt to play for dancers. Then, too, it is unfair to impose such a laborious and monotonous task on your guests. If the party is to be a small one, have a proficient man or woman to play the piano; if it be a large one, then one or two instruments as well as the piano are necessary, such as violin, cornet, or harp, varied by the addition of bells and triangles. The list of dances now in fashion is of greater length than it was some years ago. At that time the valse, the lancers, and the galop seemed to occupy the programme. The two first dances still continue to be the favourites, but others have been re-introduced: the polka takes turn with the valse, and the quadrille sometimes takes the place of that ever-bewildering, never-to-be-remembered maze, the lancers. The coquettish cotillion, the friendly country dance, and the merry reel are frequently danced: of the two latter, the Swedish dance and the Highland schottische are chiefly chosen. Even the stately minuet, the galliards, the bransle, and the torreano, danced by courtly knights and dignified dames centuries ago, are likely to be brought forward again. All the rooms in the house should be brilliantly lighted, for light induces gaiety and mirth. Darkness engenders silence and gloom. The illumination of the ball-room is another difficulty which besets the giver of dances, especially if the house be a country one. Gas makes a room very hot and oppressive, no doubt, but it is the easiest and most effectual mode of lighting a room, if it is available, and good ventilation can do much to remedy the evils it carries with it. Wax candles are objectionable on these occasions, because, fanned and irritated by the continual motion of the dancers, they drop their waxy tears on coat and dress, the traces of which remain for ever and a day. French lamps, placed on brackets at short distances, and high enough to be out of the way, shed the softest and most pleasing light. If the dance is of long duration, the lamps may require to be re-trimmed one by one during the course of the evening, or darkness will perchance descend upon the scene. A broad piece of carpet should be unrolled from the hall door to the carriage steps; and where the distance between the two is great, an awning should be stretched over the passage. As the guests arrive, they are ushered into the cloakrooms. A maid should be at her post in that reserved for ladies, to give her aid in straightening dresses, arranging hair, and removing all trace of the slight disorder caused by the carriage drive. She should be armed with needle and thread to sew up the inevitable tears and rents which occur during the evening’s campaign. It is also well to number hats, shawls, and cloaks, that they may be restored as quickly as possible to their owners on their departure. The lady having put a finishing touch to her hair, and the gentleman to his tie, the two are next conducted to the tea-room. Here a table is laid out with tea and coffee, cakes and biscuits, the beverages being dispensed by a servant. After having partaken of a cup of one or other, the new arrivals emerge from this room and are then shown into the drawing-room, where the lady of the house receives her guests Dancing should begin directly there is a sufficient number of people present to make a respectable show. 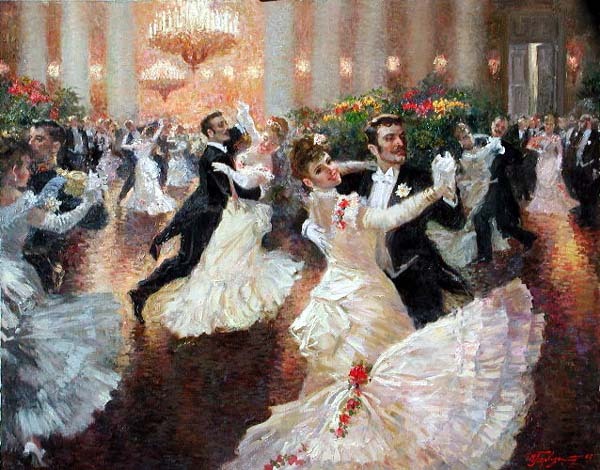 In quadrilles and other square dances, those couples who are at the top of the room always begin the figure. The fashion of programmes has become almost obsolete at the best London balls, which is a pity, as they were not only pretty souvenirs of the balls of a season, but also most convenient aids to memory at the time being; for if a girl has many partners it is no easy matter for her to remember to whom she is engaged for each dance. However, the capricious goddess for the time wills it otherwise, and only at country balls are programmes still found to survive. It is considered “bad manners” if a man fails to come and claim his partner when the dance is about to commence, or for the lady to break her promise by accepting any other partner who may have asked for the pleasure of the same dance in the interim. If a lady declines to dance with any one who may request her, but with whom she does not wish to become acquainted, and has no plea of a former engagement to offer for her refusal, the best course to take is, not to dance that particular dance at all, and then any chance of hurting the feelings of the rejected one is avoided. The number of times that a lady should dance with the same partner, except under special circumstances, should be limited. Never so often as either to attract observation, or to call forth remarks on the subject. After a dance the gentleman asks his partner whether she will take any refreshment, and if she replies in the affirmative he escorts her to the room and procures her an ice, offers to hold a cup for her, and when the music for the next dance begins he conducts her to her chaperon, when she disengages herself from his arm, they bow to one another, and he leaves her. It is not customary to promenade much after a dance. Private balls usually begin at ten p.m., and end about three a.m.; supper at one a.m. The gentleman with whom the lady has been last dancing generally takes her in to supper. It is necessary to bid good-night to your hostess, but you go away quietly, that your departure may not be noticed, lest it should tend to break up the party. @heidenkind: Don’t forget my invitation, lol! The list of dances was VERY long. “The valse, the lancers, and the galop. The polka and the quadrille. The coquettish cotillion, the friendly country dance, and the merry reel, the Swedish dance and the Highland schottische are chiefly chosen. Even the stately minuet, the galliards, the bransle, and the torreano etc. Who could possibly have learned all these dances? What happened if you were invited for a stately minuet but you were a great fan of Scottish reels? There were so many things that could go wrongly, both for the hostess and the guests. Not to mention the poor musicians. Ragtime & jazz dances drastically changed how many balls were conducted because young people who do a quick bunny hug, two-step, and a waltz, and then go off to nightclubs or other dances that same night. I have a number of English and American dance manuals, and the US was notorious for incredibly complicated country dance steps (or square dancing). My father taught me when I turned 12, his mother had taught him when he turned 12. Grandma required knowledge of social dancing, and my Dad and I never missed an opportunity. My uncles are good dancers (not as good as Dad) and many cousins are also. It’s easy to know many dances when you have grown up llearning them!! They really had it all sorted out, didn’t they? I’m surprised at the time the balls. 10 PM – 3 AM? That’s almost like raves… only with supper. I think rave organizers could learn something from the Edwardians 😀 . @Ana: hehe. Yeah, the Edwardians partied all night long.